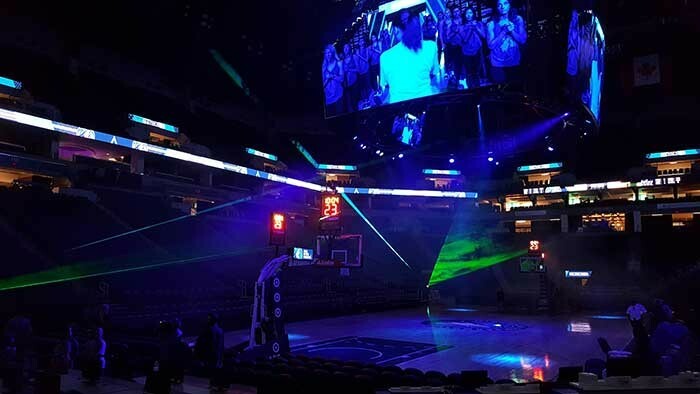 USA – Since 2015, event production company Showcore has been providing Elation Professional lighting to the Target Center in Minneapolis, Minnesota, a multi-purpose sports facility that recently underwent a $130 million renovation. Home to the NBA's Minnesota Timberwolves and the WNBA's Minnesota Lynx, the dynamic lighting system adds an extra level of excitement to games and is a major contributor to the energetic atmosphere created during the all-important pre-game hype. Showcore recently added Elation Paladin hybrid LED strobe/blinder/wash lights and compact Rayzor 360Z LED beam moving effects to the arena lighting rig to complement other Elation lights installed in 2015 and 2016, namely Arena Par Zoom and SixPar 300 LED Par lights, Rayzor Q12 LED moving heads, Protron 3K LED strobes and Cuepix WW2 LED blinder/strip lights. 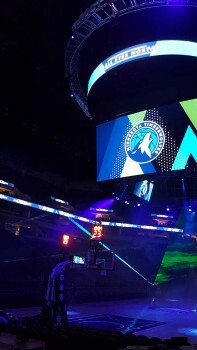 In 2016, as part of the arena renovation, the Target Center installed a large Daktronics scoreboard and the majority of the new lighting is installed on or near it at trim heights that can exceed 100 feet. A pair of versatile Paladin hybrid LED luminaires that can be used as a high-output wash light, strobe or blinder operate from stick trusses on each side of the scoreboard with two additional Paladins mounted on adjacent catwalks. “The trim from the scoreboard is 75 feet and from the catwalk it is 100 feet so the throw distance is huge,” Wabaunsee says of the Paladins that are used to blast and strobe Timberwolves and Lynx team colours. “It’s a powerful fixture and although we can control the beam with the zoom we wanted to avoid light on the screen so we have them equipped with barndoors.” The Paladins are used to colour match with 12 neighbouring Elation SixPar 300s, which Wabaunsee says was initially a concern but has worked out just fine. On the lower part of the scoreboard, two Arena Par Zoom RGBW PAR wash lights with zoom are used for specials along with four Protron 3K LED strobes and other lighting. On the bottom of the scoreboard are 20 powerful Cuepix WW2 white light blinders, each with two 100 Watt warm white COB LED modules. The fixtures are used for their incandescent look and LED blinder effect while an additional two fixtures are mounted on the catwalk and used to illuminate a flag. 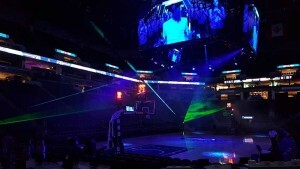 During halftime, additional lighting is added to the mix in the form of a light cart with eight Rayzor Q12 Zoom that is wheeled out onto the court and used for additional beamage and point light. The Elation lighting is used to not only create movement, energy and excitement at each home game, it engages the audience and helps promote the brand. Used for dance routines and halftime activities, perhaps its most important role is during player entrances and introductions when dynamic lighting effects are used to pump up both player and fan prior to a game. The pre-game light show is awash in colours representing the team´s corporate design and colours and reflects the dynamism of the coming action on court. Showcore specified and supplied the lighting fixtures used in the Target Center and created the lighting looks used at Timberwolves and Lynx home games. Showcore also handles product service and support when needed. The Target Center also hosts a myriad of other events throughout the year and the lighting rig is used for these events too. 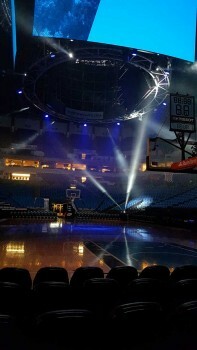 “We also do a number of additional events throughout the year for the Timberwolves and Lynx that we use quite a bit of Elation products on like dance auditions and production days with dancers,” says Wabaunsee, noting that Showcore stocks quite a bit of Elation lighting in their shop that they use for a variety of non-Target Center related events as well. Elation product support for Showcore is provided by Elation manufacturer rep firm Five Lakes Marketing, who Wabaunsee says is very responsive to their needs.